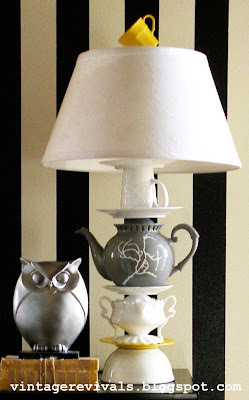 Lately I have seen lots of amazing DIY lamps. I have been admiring one in particular which belongs to Mandi from Vintage Revivals. 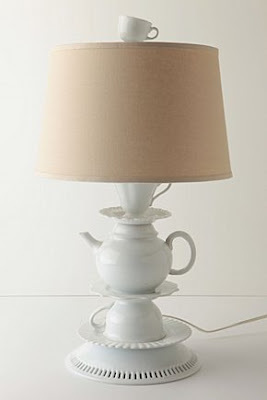 She created the coolest DIY Anthropologie teacup lamp. You can make lamps out of just about anything; vases, statues, etc. However, if your like me the electrical "know how" involved might be holding you back. Before starting, make sure lamp is not plugged in. Use the screwdriver to press the sleeve of the socket out. If the socket has a "press here" inscription, press your thumb on the inscription and lift the sleeve off. Pull the socket up and use the wire cutter to cut/disconnect the old wires. Flip lamp over and unscrew nut on bottom of lamp base. Pull thread up and remove old socket. Pull the cord out of the bottom of the fixture. Feed the new cord from the lamp kit through the hole in the bottom of the lamp until it comes out at the top, and attach new socket. Using the wire cutters, split wires by cutting along the groove. Use the wire cutter to remove approximately an inch of the insulation from each wire. Tie the split cords using an underwriter's knot. Make a loop with each wire and then feed the opposite color wire through each loop to create a figure eight. Note: Check the lamp kit's instructions for an illustration. Use the screwdriver to loosen the screws on either side of the new socket. Wrap each exposed wire around a screw on the socket. Use the screwdriver to tighten the screws and hold the wires in place. Slide the sleeve back on the socket until it snaps into place. Test the wire by plugging it into an outlet. After reading this I am definitely going to give it a try!